William Smith belonged to Muirmaillen or Moremellen, which was lcoated near to Murdostoun Castle. He took part in the Pentland Rising in 1666, after which he was a wanted man. He was caught up by two men who murdered him, then cut off his head from his body. The corpse was left on the moor, near a place called Shottsmyres. His body was later found and buiried in the kirkyard at Kirk o' Shotts. 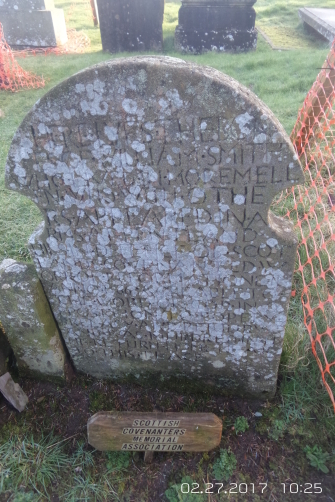 The small headstone to William Smith is located within Kirk o' Shotts kirkyard. It is a replacement of 1836 for an older stone which no longer exists.